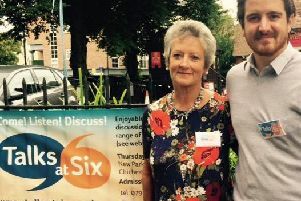 Chichester’s highly-successful Talks at Six series, run by mother and son Marilyn and Freddie Humphrey, is celebrating its second birthday. Thursday, April 12: Luckes Live Well by Melanie Luckes who founded, a year ago in North Street, a fresh food café and wellbeing clinic with the aim of making it easier to eat well and receive treatment from some of the 15 therapists who work there. Thursday, April 26: Past, Present and Future of Watchmaking by Peter Mellor and Josh from RL Austin in Chichester. They will give a history of watchmaking and discuss what is happening within the industry today, fashion, investment and where it is going. Thursday, May 3: The Story behind your Peppers from Plant to Plate! by Gerard Vonk who runs the Tangmere pepper plant, with “the most amazing hydroponic system”. Gerard will explain how they grow and harvest peppers, with care for the environment and to the highest food safety and farming standards. Thursday, May 10: Victorian Oysterboat by Judi Darley. Emsworth’s fully-restored Victorian Oysterboat Terror, owned by the Conservancy, is operated and skippered by volunteers. It was built 125 years ago as one of the many boats serving the thriving oyster businesses but then disaster struck. Come and find out what happened to the changing fortunes of the industry. Thursday May 17: Life in a Buddhist Monastery by Ajahn Karuniko. The Abbot will talk about the origins of the monastery, daily life in the monastery at Chithurst and the relationship to the lay community. Thursday, May 31: The Ten Greatest Advances in Treatment of Heart Disease by Colin Reid. Colin, who trained at Harefield Hospital with heart transplant pioneer Prof Sir Magdi Yacoub, will describe the advances in the management of heart disease over the time of his career.